First of all, thank you everyone for your overwhelmingly enthusiastic response to our call for peacoat test sewers! We have selected our group of test sewers after a lot of deliberation. It was so difficult to choose from all the detailed emails and comments we received! Even if we didn’t select you this time, that didn’t mean you won’t have a chance to test sew in the future as we added everyone how applied to our test sewing mailing list! Now, moving forward, did you notice the changes we made to the photos on our website this week? Check them out! We added a new version of the Strathcona Henley and decided to feature the beautiful Jedediah Pants that my mother-in-law sewed up. It was my dad’s birthday last weekend so I sewed him a Strathcona Henley as per his request. This time, I chose a beautifully soft cotton knit with hardly any ribbing and a fairly stable jersey for the placket. The sewing process was so much easier than it was with the heavily ribbed knit I had used for Matt’s henley because both my serger and sewing machine decided they agreed with my fabric choice! We’ve updated the website photos to show my dad skillfully modelling his new shirt. He’s become quite a pro; we quickly walked to the park and he matter-of-factly began to strike poses…even though there were kids and parents watching at the play ground! Who would of thought my dad would be our easiest model! Dad’s birthday henley in a wonderfully soft striped cotton knit with a contrast jersey placket. While we were on a roll we also photographed the cardigan that my Mom had sewn my dad when we were in the pattern testing phase with the Newcastle Cardigan last spring. Even though the cardigan has been worn by everyone from my school’s fashion show model to my grandpa when he’s visiting and chilly the cardigan has never been properly photographed. My mom did an excellent job on it using a heavy (and thus difficult to handle) sweatshirt fleece and gorgeous leather details. She even added leather elbow patches which make the cardigan look so sophisticated! My dad loves wearing it when he walks their dog, Jake, now that it is getting pretty cold in the evenings. As you can see, it looks really nice on him! Last but not least, I have another excellent version of the Newcastle to show you. Diana sewed this version and included a couple top stitching and fit modifications. She added a strip of fabric at the side seam to increase the width of the body and I think that the extra seam lines create a really nice structured look. The fabric and buttons she chose are just perfect and the tag she stitched in using a contrast thread makes the cardigan look like it has just been purchased from a high end menswear boutique! Great job Diana and thanks for sharing your photos with us! I hope everyone had a fun Halloween! Matt and I are really excited that it is now November…we have a lot of big things planned for Thread Theory this month! Categories: Friday Posts, newcastle cardigan, Showcase, Strathcona Henley | Tags: flickr group, test sewers | Permalink. That is such great fabric on Diana’s version! I just made a muslin of the Newcastle for my husband and looks like I need to add some additional width and the side seams would be the perfect place! The overall fit is good but I need some extra room around the middle. Any tips would be much appreciated! I’m sewing an XL. Thanks! I hope I am not too late to give you tips on adding room around the middle! Diana’s fabric is so RTW, I love it! Here is a link to her Kollabora post where she shows the added band of fabric at the side seam: http://www.kollabora.com/projects/newcastle-cardigan-0 Her cardigan turned out beautifully but I’m not sure how she kept the armscye the same size. Maybe she would give you some information if you comment on her project? I suppose my approach would be to add the band as a separate paper pattern piece, measure the original armhole curve using a measuring tape and measure the new armhole curve with the added paper piece (but remember not to include seam allowances in these measurements!). Then I would adjust the curve of the armhole to match the old measurement while keeping the curve (including the new pattern piece) as close to the shape of the original armscye as possible. Good luck with your Newcastle! I love the fabric Diana did her Newcastle in! I have been looking at wool knits, but they seam kind of wimpy for this type of garment. 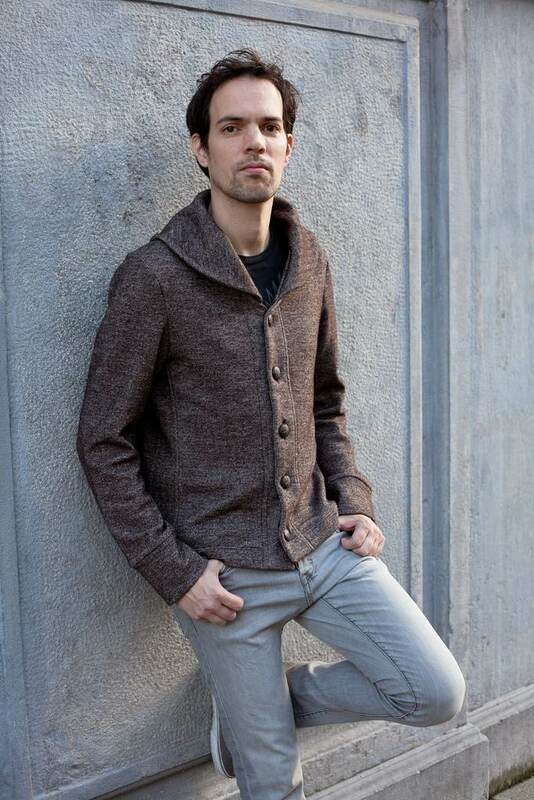 I have also considered sweatshirt fleece, but haven’t found anything that looks guyish, other than black (ugh)! Any recommendations on fabric for the Newcastle? Can I use a woven? Any online sources? Did Diana leave the name and/or source regarding her fabric? Thanks and I love your guy patterns! Don’t hesitate to ask more questions or run any fabric possibilities by me 🙂 Good luck with your Newcastle! On their website they state they ship internationally, so you can contact them for an estimate on shipping to where you live. Thanks for providing the link Diana! I really like the unusual selection of knits!